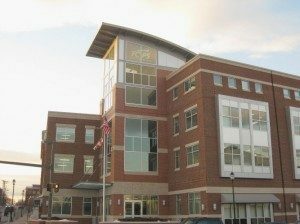 The Frederick County Board of Education New Central Office Facility is a design build project for a new 90,000 square foot, five story shell space with 75,000 square feet of tenant fit-out. This facility consolidates all the administrative office functions for the Board of Education at the Central Facility. In addition to administrative offices, the facility houses several specialty areas. They are as following; a large public meeting/board hearing room, TV studio w/ video editing capability, the Board of Education Central Data Processing Facility, including back-up emergency power and specialized independent computer room HVAC system.